Looking for Disposable Covers? Look no further! These disposable covers are universally fit for both small or big jobs. 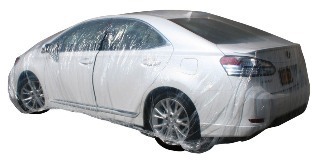 Covering everything from Cars and Station Wagons to SUVs and Vans our covers protect just about everything when a temporary solution is needed. This cover is fitted with with an elastic hem to ensure a tight fit and offers protection from dirt, dust, grime, and foul weather. Contractors and Painters are big fans of this cheap solution to a very expensive problem. Protect vehicles, patio furniture and shrubbery from paint or power wash over spray or the dust and dirt created from a construction job. Our Universal Disposable Covers are up to the task whenever or wherever you need them! Approx. 2lbs each. Come in 5 Packs Only. Bulk Discounts Available.